The stereo 3D (S3D) film industry is stagnating. And one of the major factors behind it is the eyestrain and headaches commonly experienced by the viewers due to poor quality of produced S3D content. The Graphics & Media Lab CMC of Lomonosov Moscow State University (further: the Lab) has already published 6 reports since March 2013 investigating this problem and assessing technical quality of various S3D films. The sixth report introduced the comprehensive analysis of the stereo-window violation issue (Image #1) and the use of floating windows in stereoscopic films both from technical and creative perspectives. This problem often receives very little attention, while addressing it is crucial for delivering high-quality S3D content. It can greatly benefit from careful planning of the shooting and it is another factor that contributes to the overall importance of proper pre-production in stereoscopy. The report presents per-frame charts that enable the analysis of floating window behaviour with respect to disparity of the closest object near the edge of the frame (Image #2). 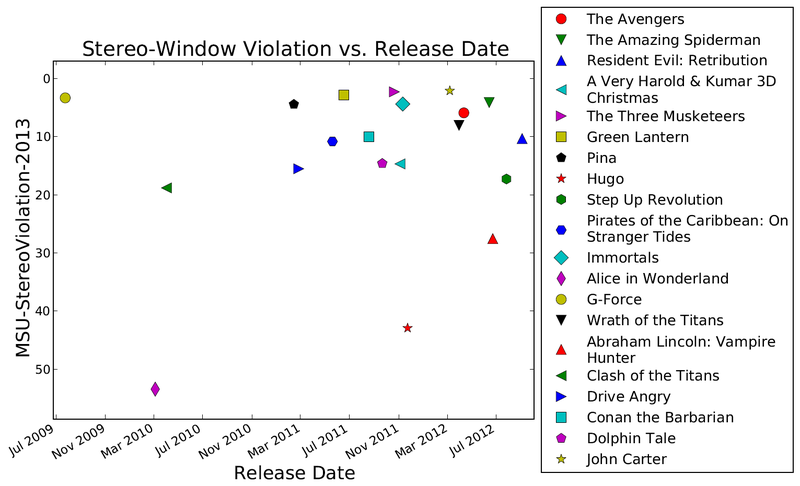 The charts are accompanied by visualizations of the most noticeable window violations. Image #2: Example of a per-frame chart, illustrating the active use of dynamic positive-parallax floating windows in Pina. Such floating windows are usually used to further enhance the perception of depth in a scene. 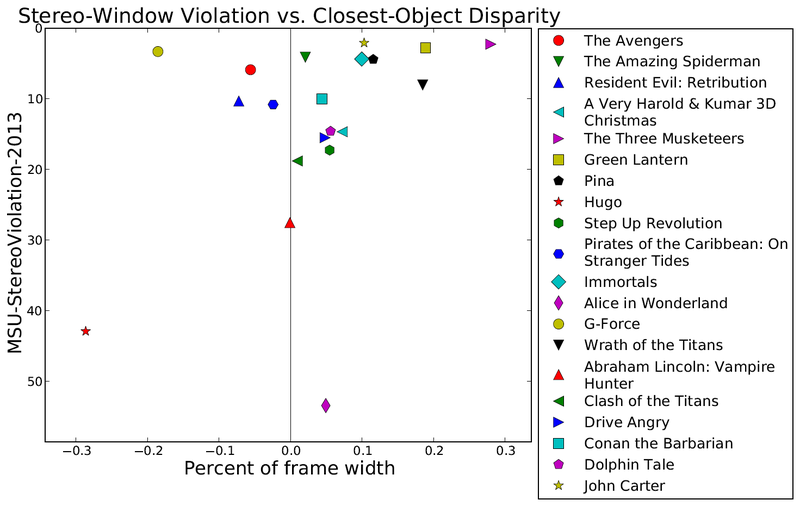 The overall comparison of films now includes all 20 films analyzed in sixth and seventh reports. 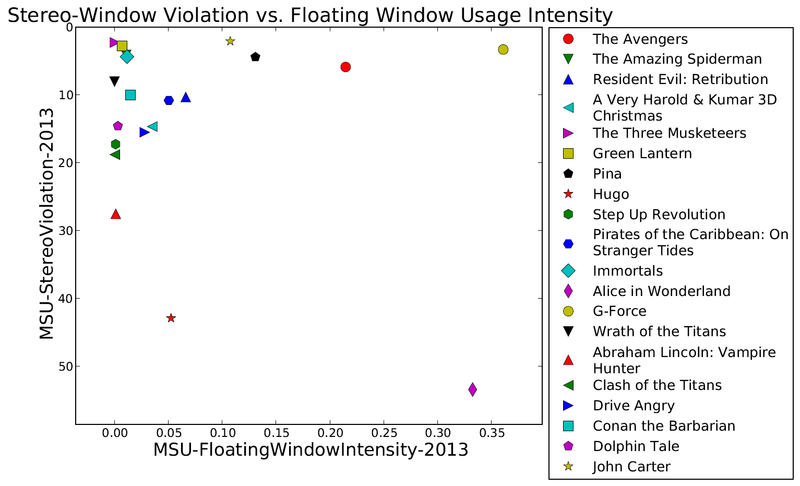 Films with intense floating-window use generally have less prominent stereo-window violations. Several movies, however, achieved low number of noticeable stereo-window violations without using floating windows, which means that some alternative techniques were used. The most common approaches include: intentional darkening shotвЂ™s edges which can lessen the negative effect of stereo-window violations, shifting the overall parallax range of the film towards positive values and careful pre-production to minimize the number of shots where negative-parallax objects appear near the sides of the screen. Movies like The Three Musketeers, Green Lantern and Wrath of the Titans have a lot fewer objects in negative parallax near the edges of the screen, that led to good stereo-window-violation handling quality without using floating windows.